If you are wondering what to do in Victoria B.C., then this is the vlog for you. 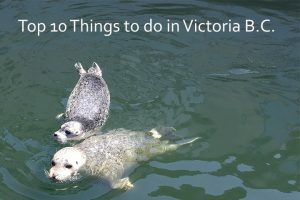 We are going to share with you our top ten things to do in Victoria B.C. Put on your pedometers and fitbits because most of them are in walking distance in downtown Victoria and you will have bragging rights about the number of steps you walk each day. Some of them are a short drive out of town if you have a car. We have shared our best free things to do in Victoria and some of the things that are well worth the money. Whale watching in Victoria BC is a once in a lifetime opportunity. It is worth the extra money to go out on a whale watching tour. If you are in Victoria and you have the time and money, make sure you go whale watching at least once. One of the most interesting things to do in Victoria BC is visit Fan Tam Alley in Chinatown. The Alley is great for photography and shopping. My personal favourite is Kid Sister Ice Cream. My favourite place to shop in Victoria BC are the shops on Lower Johnson and then walk along Government Street. There are lots of independently owned businesses with local artisans that you will not find anywhere else. Victoria BC has no shortage of fabulous bakeries. Our personal favourite is Crust Bakery on Fort Street. I would recommend their cronuts, a cross between a croissant and a donut. The gate to the Beacon Hill Children’s Farm open’s at 10 am in the summer and everyday at 10:10 am there is the adorable “Running of the Goats,” 30 seconds of sheer joy. Beacon Hill Park is over 200 acres of gorgeous parkland in downtown Victoria BC. There are bridges, lakes, ponds, paths, gardens, trees, flowers, running streams, ducks, birds, wildlife, eagles, and blue herons. It is a beautiful place to go for a walk or sit on a park bench. If you have a car you can take a short drive out of town to Goldstream Provincial Park. The park boasts some beautiful old-growth trees including Douglas firs and Western Red Cedars. Some of them are 600 years old. You can walk the flat trails around the lower part of the park or if you are feeling adventurous take a hike up to the Railway Trestle. Again if you have a car you can drive out to Saanich and take a drive to the top of Mount Doug from noon to dusk each day. Churchill Drive allows you to drive to the top seven days a week, or if you are feeling fit, you can take any of the trails from the bottom to the summit for spectacular 360 degree views of the city. Our favourite restaurant in Victoria BC is Red Fish Blue Fish. Red Fish Blue Fish actually isn’t a restaurant, you have to line up and for a long time at an up-cycled cargo container in the Inner Harbour for your fish and chips or tacones. Then you get to sit on the wooden pier and eat your seafood with a view of the sea planes, sailboats, kayakers and seals in the inner harbour. I will say it again, is worth the line up! Our number one thing to do in Victoria BC is to feed the seals at Oak Bay Marina. The harbour seals are super fun and entertaining as you throw them frozen fish pieces. You will love capturing their cute faces for your instagram feed. This is always the highlight of our visitors’ stay. So there you have it. 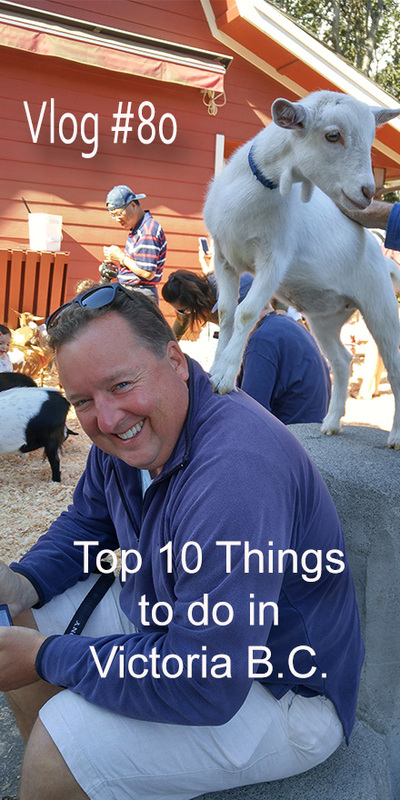 Our top 10 things to do in Victoria BC. What are your favourite things to do in Victoria BC? Would you change the order of our list? What would you add? What would you take away? Leave your comments, let us know. Thanks for watching, please subscribe, turn on notifications and like this video. Tagged as: BC Whale Tours, Beacon Hill Park, Beacon Hill Petting Zoo, Crust Bakery, Dr Melissa West, fan tan alley, Fan Tan Alley shops, Goldstream Provincial Park, Kid Sister Ice Cream, Melissa West, oak bay marina, restaurants in Victoria B.C., restaurants Victoria BC, shopping in Victoria BC, things to do in Victoria BC, Victoria Bakery, Victoria BC, Victoria restaurants, Victoria whale watching, whale watching tours, whale watching Victoria, whale watching Victoria BC, what to do in Victoria B.C.